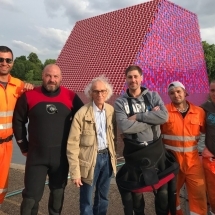 World-famous artist Christo is creating one more floating structure after his amazing art project “Floating piers” in Italy 2 years ago.Now his work enlivens into a magical Mastaba in Serpentine lake in Hyde park, London.“The mastaba is a very ancient form,” Christo explains in front of a journalist from Guardian. “It originated in Mesopotamia at the time humans moved from agricultural societies to urban ones. It became common as the shape of benches outside the first urban Mesopotamian homes. Later it became associated with pharaohs’ tombs. ”The artist chose to work with the team of Deep Dive Systems again. 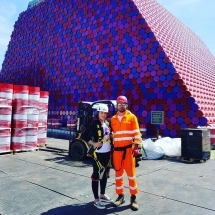 Together they realized “Floating piers” project in Italy in 2016.Deep Dive Systems under the brand of Buldock is taking part in constructing and anchoring of the floating structure. 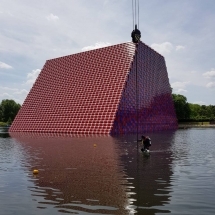 The Mastaba itself is a stack of 55-gallon barrels, numbering 7,506 in all, floating on the lake.Christo`s Mastaba is a modern masterpiece. It is 20m high by 30m wide and 40m long.The size is impressive but also are the colors. The ancient structure combines red, blue and mauve on the vertical walls. The barrels on the slanting walls are red with a white ring.The artist with Bulgarian roots says he chose these exact colors because of the landscape, the vegetation, the foliage of the trees and of course because of the rainy and the sunny days in London.The team of BulDock who is also from Bulgaria has the privilege to give shape to projects that first live only on a piece of paper.They made the floating platform for the Mastaba of 9000 cubes – double layer of cubes. It is typical for the brand of BulDock.The cubes are quality modular systems made from high density polyethylene (HDPE) – a polymer with numerous properties, including chemical resistance, impact resistance and high strength.The previous tests for the Mastaba were held in a hidden place. The main purpose of professionalists was to supervise how the platform was reacting to the movements of the water and the wind and most importantly how the superstructure will be behaving on the platform. All of Christo`s art projects are self-financed. He creates them for people for free. There is no exception this time. 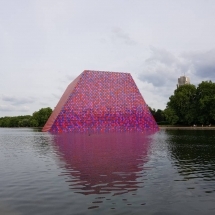 Today is the first day people can enjoy the breathtaking London Mastaba. There is no tickets or reservation. It will be opened for everyone who want to see it until September 23.